The Lodge at Pipers Brook is being constructed to provide holiday accommodation for visitors from Malverns Worldwide. Pipers Brook is situated in a small village in the Teme Valley, an area of celebrated undulating country. 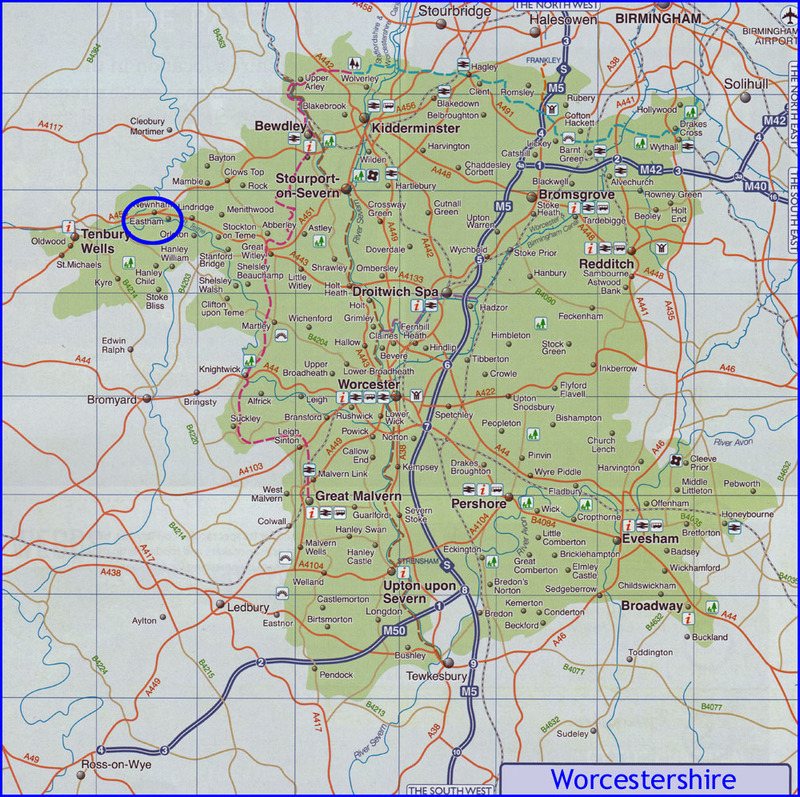 It lies within the Malvern Hills District Council region in Worcestershire England. The Lodge is scheduled to be available from Summer 2019. The sequence of pictures above illustrate the development of the Lodge as well as associated points of interest. By February 2019 the new drive was dug and surfacing commenced. This created a massive spoil surplus that was then taken to the area below the pond where it was used to landscape the hollow above the stream. The Malverns Worldwide project was created to bring together Malverns located throughout the globe. Great Malvern, the original Malvern in England, was first established by St Werstan in the reign of Edward the Confessor in 11th century England. Malvern spring waters flow out from the springs of the Malvern Hills and trigger abundant life in the surrounding lands. This is a metaphor for the subsequent founding of two dozen or more Malverns throughout the world. 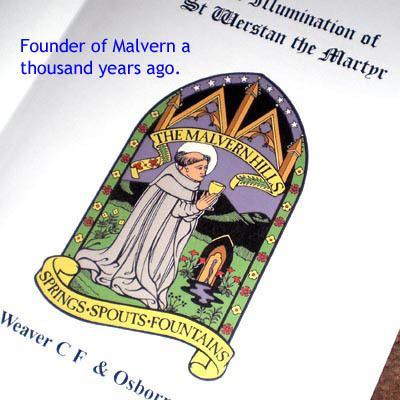 Malverns Worldwide is an initiative to encourage active friendship between all Malverns. It is masterminded by the Friends of Malvern Springs and Wells with the support of the Malvern Hills District Council. To discover more click website below. For those from Malverns elsewhere looking to visit Great Malvern and the Malvern Hills as part of an exploration of England, the Lodge 'Up the Creek' will offer an option for accommodation. The Lodge is being constructed in peaceful archetypal English countryside on the edge of Eastham village. Alongside the Lodge are green fields and a woodland with a brook in a gorge (nicknamed 'the creek'). 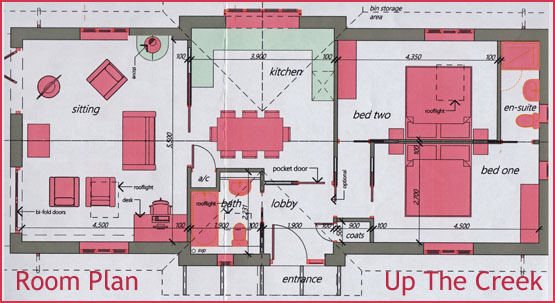 It will provide accommodation for up to 4 persons and ample space for outdoor recreation when not indoors. In the immediate vicinity are several walks for those wishing to explore the Teme Valley and the historic spa town of Tenbury Wells is only 10 minutes away by car. Here can be found modern shopping facilities albeit within this 19th century former spa resort. The Lodge is self catering but the local manageress who lives nearby at Pipers Brook may well be willing to cook by prior arrangement as well as offer other services such as washing and ironing. Also there are numerous restaurants within a short car drive. The Malvern Hills and the several associated communities with the name Malvern, including Great Malvern itself, lie to the south. Here numerous attractions can be explored including the medieval abbey, Morgan motor works, Malvern Museum, the Malvern Hills with their springs and wells and much more. From the Lodge, Birmingham can be reached within an hour by car and this again offers many interesting exploration opportunities as well as an international airport. The Malverns are located within the county of Worcestershire in the West Midlands and Worcester, the historic county town, lies some 20 miles to the east of Pipers Brook. London is just under three hours away by car. 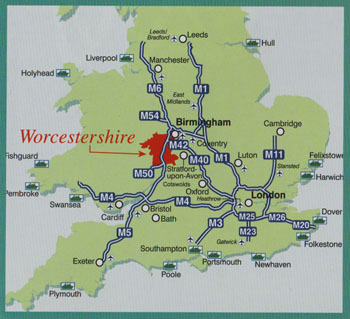 To view a detailed map of Worcestershire with Eastham highlighted click the map of England's motorway routes right. For the local Tourist Information Centres at Tenbury Wells and Great Malvern click above.